– Any outdoor evening event can be enhanced with the use of extra lighting. Candles are always beautiful outside and twinkle lights strung above or on surrounding greenery would create a beautiful ambiance for the space. 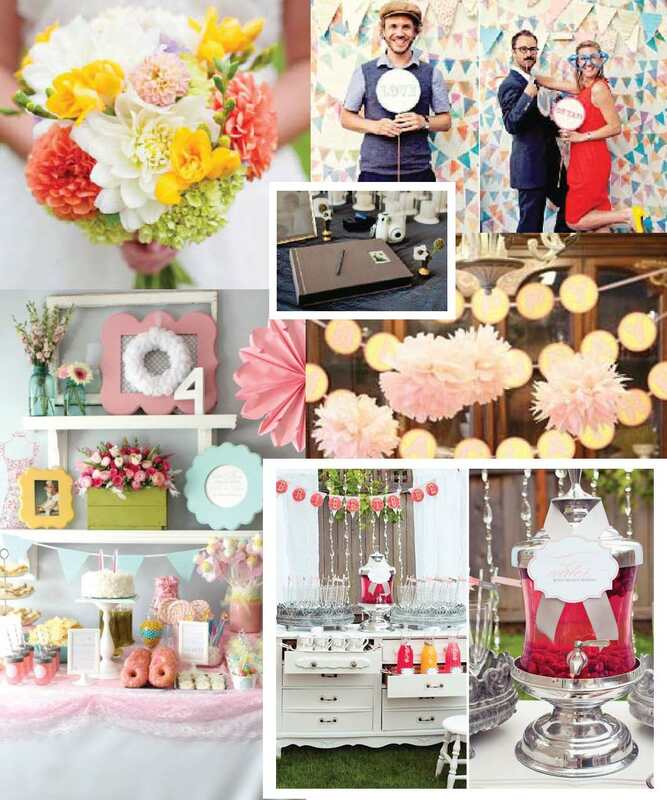 – Flowers, fabrics and decor are the perfect way to bring together any color scheme. I would recommend one large floral arrangement on the card/gift table and small vases of individual flowers scattered around the other tables. Burlap, lace and doilies would look lovely with a yellow, green and peach-pink floral pattered fabric. These could be used as table runners, backdrops and cute details. Fabric or tissue poms are inexpensive ways to create cute and coordinating decor. – A lemonade bar! Start with standard lemonade that can be enhanced with flavored syrups (raspberry, strawberry and lime work perfectly with the color scheme!) and fresh fruit (berries and lemon and lime wedges) to make your own personal concoction. Mason jars with stripey straws or cute stir sticks would add another cute detail. – Often, there are a few popular weekends for graduation parties that have everyone attending multiple parties in one day. Because of this, I recommend serving food that’s a bit lighter and unique from what you typically see at graduation parties. A dessert and vintage candy bar, mini breakfast items, or ice cream sundaes give guests something new to taste! – A photo booth creates extra opportunities to take pictures with all of the friends and family stopping by. An instant print camera (such as the Fuji Instax Mini) allows guests to not only take photos, but put them into a keepsake album/guest book with a personal note. Such a wonderful way for friends and family to give advice and well wishes to the new graduate! This entry was posted in Party Inspiration, Pinspiration and tagged graduation party, green, orange, pink, yellow. Bookmark the permalink. What great ideas! I’m planning my wedding reception at the moment and I’m absorbing so many wonderful ideas from all over the internet. I think I’ll use fabric, as you’ve suggested, for adding color on tables as table runners. I’ve found a great site that sells fabric in bulk at really reasonable prices. Thanks for sharing and good luck with your wedding planning!